Friend: “Hey James, you like coffee. You should go on the Coffee Journey”. The combination of words coffee + journey had me hooked straight away. I signed up without asking what would be involved. If my friend had said, “Hey James, would you like to go away for three days with a bunch of people you don’t know with no internet and no hot water”, I may not have signed up. I’m glad I did. 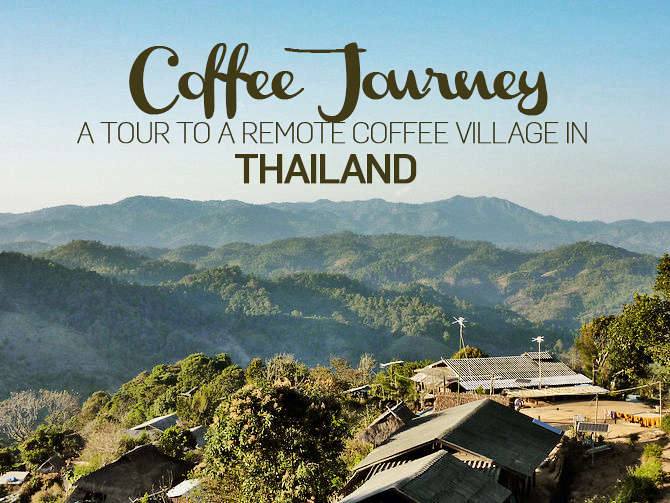 The Coffee Journey is a tour put on by the owner of Akha Ama Coffee, a cafe I frequent regularly in Chiang Mai. 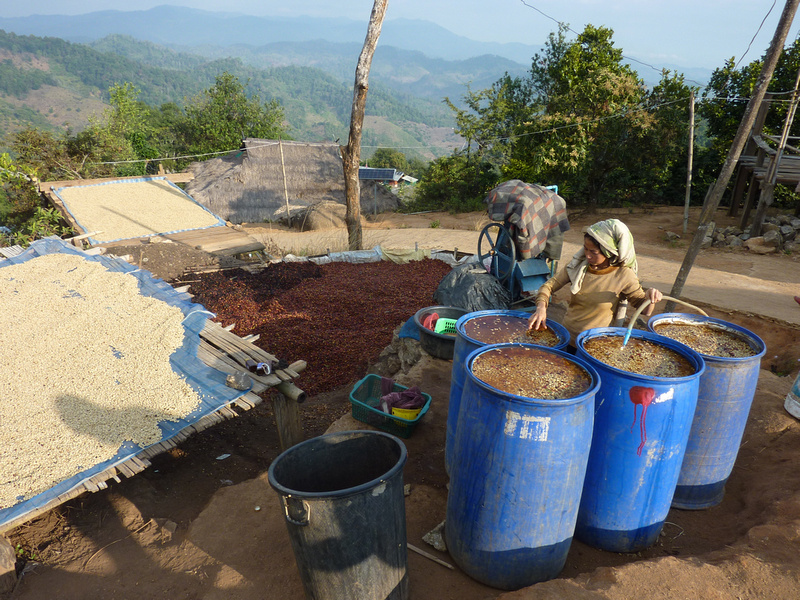 Lee runs the cafe in Chiang Mai and the coffee is grown at his village in far Northern Thailand. With free wi-fi and possibly the best coffee in Chiang Mai, the Akha Ama cafe is a haven for remote workers, in a city full of remote workers. The tour runs a few times a year, leaving Chiang Mai on a Friday morning and returning on Sunday afternoon. The ride to the village is about 5 hours from Chiang Mai. Once at the village we were invited into Lee’s family home where he talked about village life and its people. 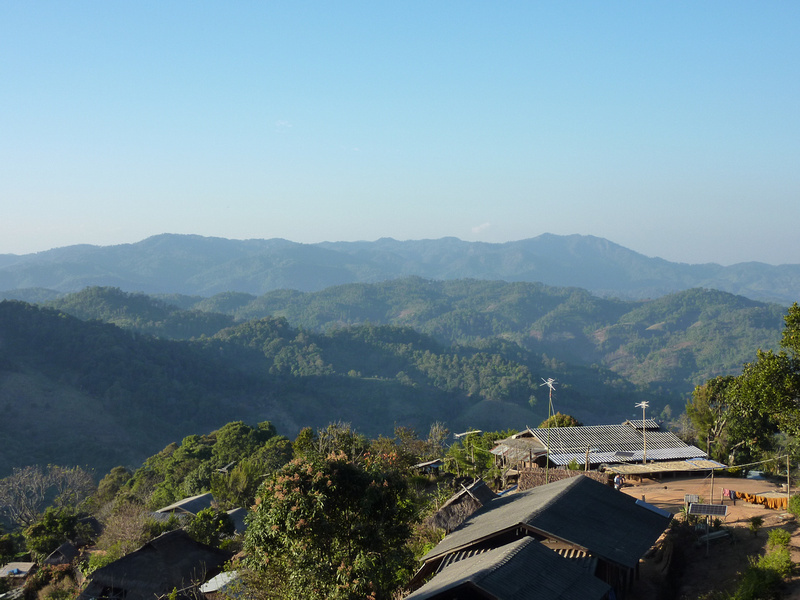 This region is home to the Akha people (Akha Ama means Akha Mother). We ate dinner in his home (thanks Ama), and were billeted out to homes in the village. Saturday morning. Breakfast, and finally a coffee! On the Saturday we walked an hour to the coffee plantation, where we got to see the full cycle of a coffee plant, from seedling to a mature tree. I was expecting a plantation type set up, with rows of coffee trees. 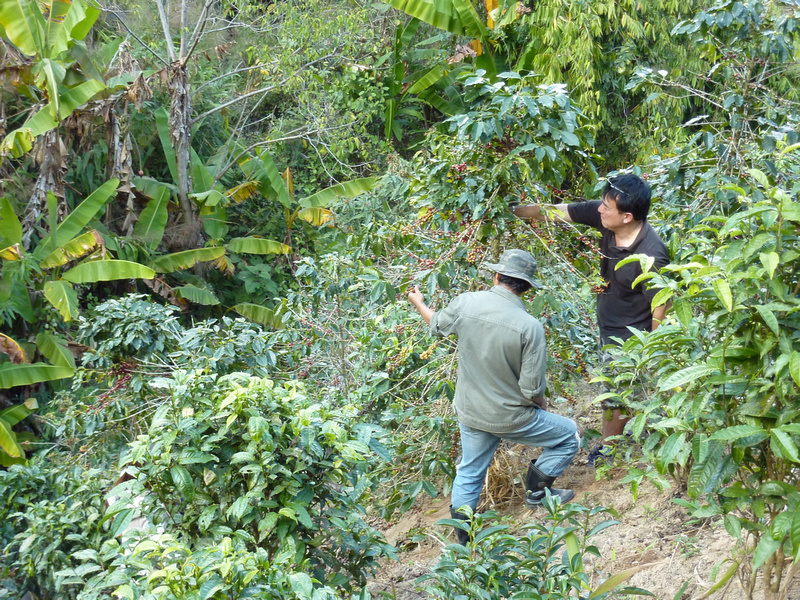 Instead the coffee trees are mixed with larger trees and other fruit trees, which gives natural shade to the coffee. In addition to running this business, Lee has also been teaching the local farmers the benefits of using compost as fertilizer, rather than using chemical fertilizer. The coffee is organic, though it is not marketed as organic as it costs thousands of Euros to have official accreditation as an organic product. 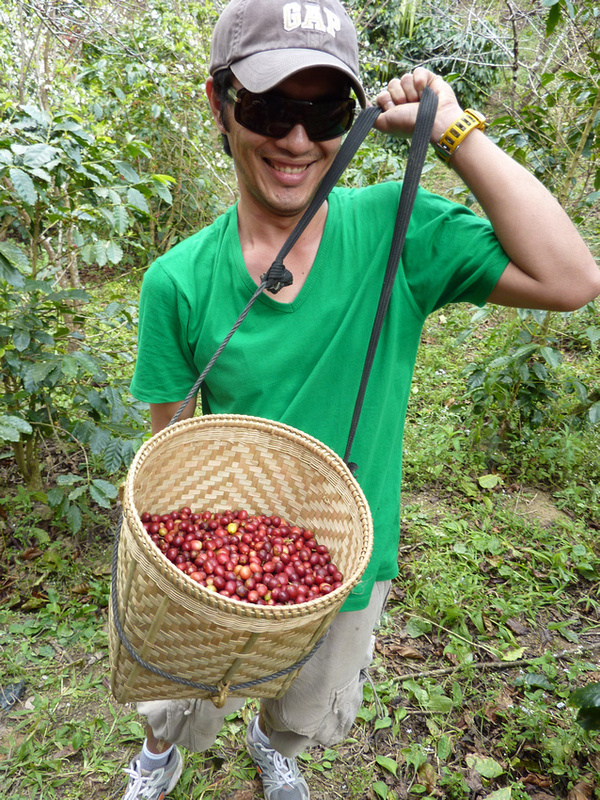 After lunch we got the hands on experience of picking the coffee ourselves. This is quite an art form as you have have to pick the right coffee cherries (the dark red one and not the light red or green cherries). Care is also needed to not break the stem from the branch. Talk about pressure. To make it even more stressful, I had a seven year old girl who designated herself as union leader, and was inspecting all of my pickings for green cherries. In addition to picking the right colour cherry and not breaking any stems, the trees were located on a very steep hillside. There were falls and cherry spillage among us amateur pickers. On the last morning we were shown how the picked cherries are processed. First the fruit is stripped from the bean and then the bad beans are removed. From there the beans are soaked for 2 to 3 days in water. After that they are hand washed. All of them! The unwashed beans are quite slippery, so after hand washing the beans are removed of this slippery film. From here the beans are then sun dried for a couple of weeks, depending on the weather. Once dried the beans are bagged and stored for six months. The beans are then machine processed to remove the outer husk, then finally ready for roasting. Talk about a process. I have a new appreciation for coffee (on top of the appreciation I already have for coffee). I will never look at a coffee the same way again. If you love coffee I would highly recommend this tour. 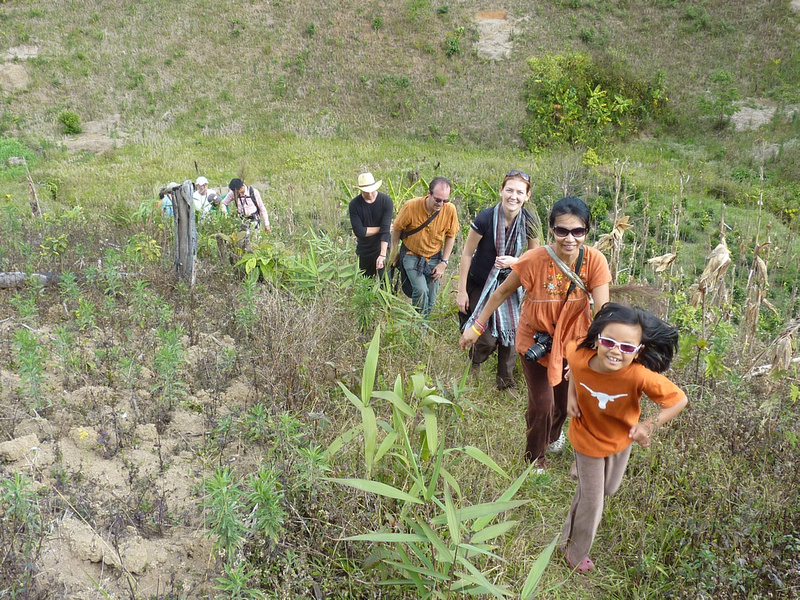 For details on the tour check out the Akha Ama Facebook page. The tours aren’t on a regular schedule so you may need to check back regularly. We’ve heard of this tour from another traveler who highly recommended it. It looks like a lot of fun and educational at the same time. Will definitely check it out when we’re Thailand. Word of mouth is a powerful force it seems. I highly recommend it! Wow what a process! Going to Thailand soon and definitely need to investigate more. thanks for the scoop! Hi James! I am an avid traveler myself and am in the process of putting together my next trip which will be mainly around Thailand and Cambodia. I just learned about Laos today and have been nonstop researching it for the past 6 hours haha. I randomly came across your travel blog and just had to say that it is absolutely wonderful! Beautiful pictures and great descriptions. The more I read about it the more I feel it absolutely necessary to make a trip to Laos; just seems a bit difficult to get to. So, just wanted to thank you for the great website and all the information from your trips. Happy travels! Hi Calle, thanks for the feedback, I really appreciate it! 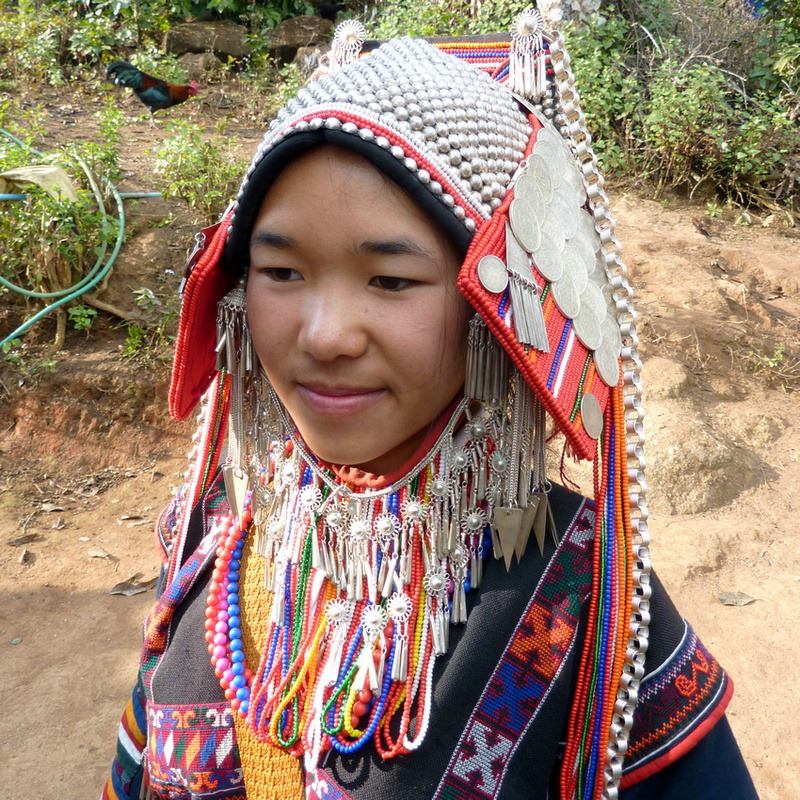 If you are making a trip to Thailand and Cambodia, Laos will fit in well with your travels. You can do a loop that will include Laos. 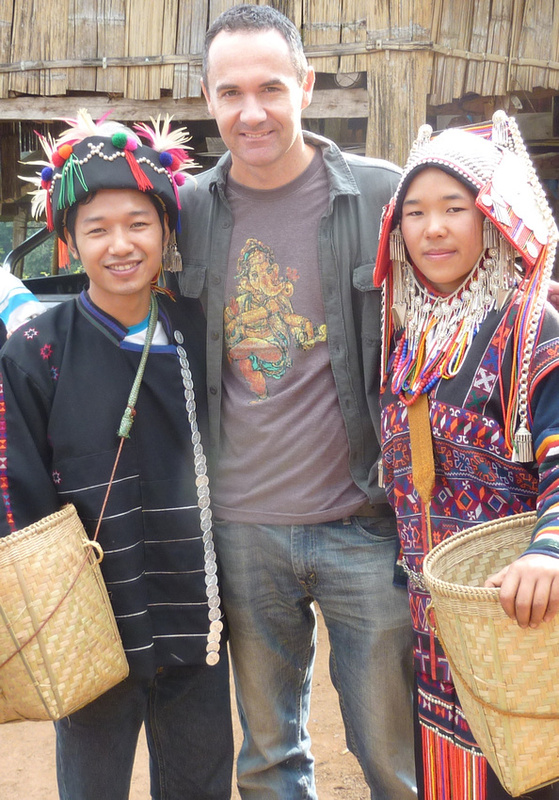 For example you could travel up to Northern Thailand and cross into Laos from there. 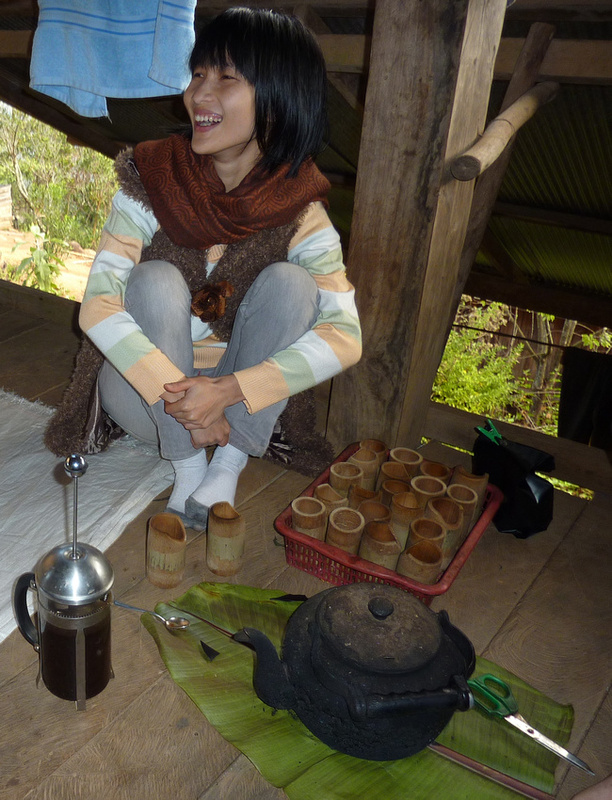 Travel down Laos until you get to Si Phan Don (Four Thousand Islands). From there you are near the Cambodia border. 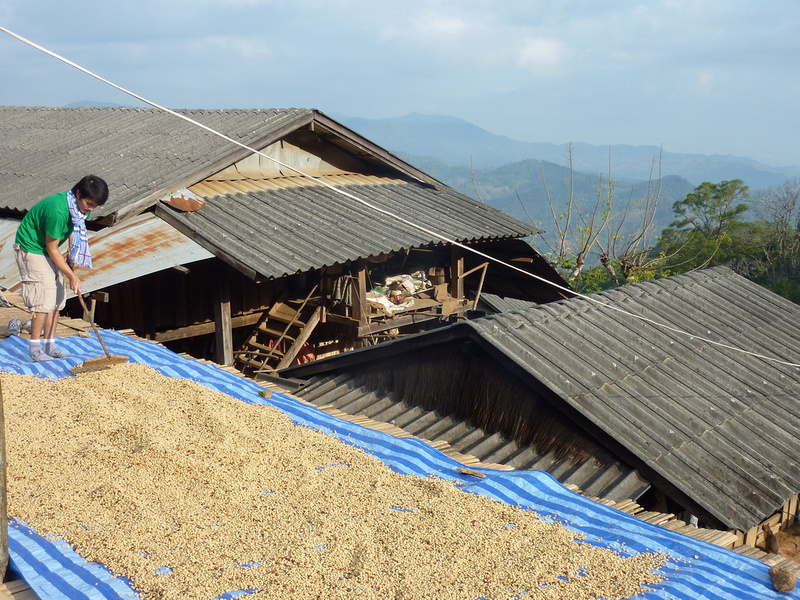 Thanks for sharing this overview of the coffee tour, I wished I was there for it in person (I love coffee) but your photos and commentary tell the story well. It’s nice to be reminded of the process, people and labour of love behind creating the things that bring us joy – makes you appreciate it even more. @Ray – great to meet you both. I’m sure to run into you again in Bangkok. 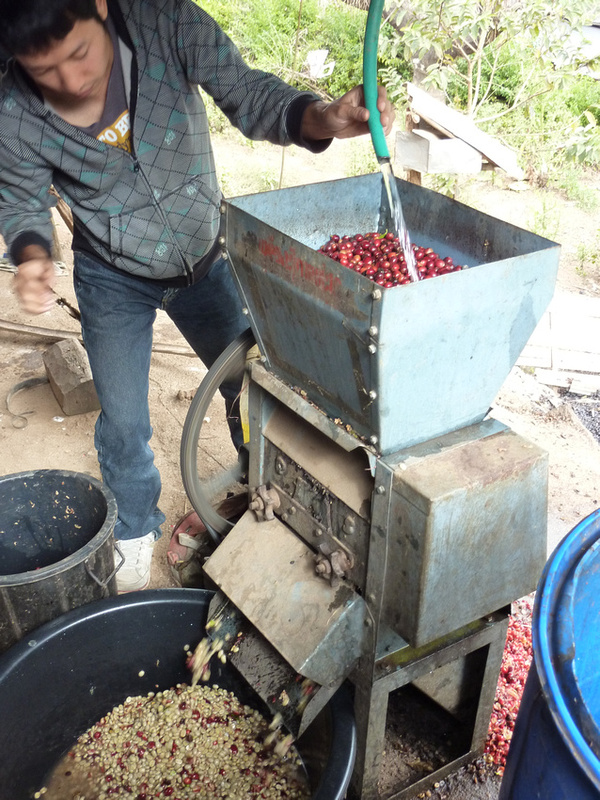 To see how coffee cherries start before becoming fresh roasted coffee beans is quite an experience. Glad you enjoyed it! Thanks for the write up and the pics! It was truly a great weekend. I look forward to seeing the coffee plantations in Colombia one day as well. Did you buy coffee beans during the tour? 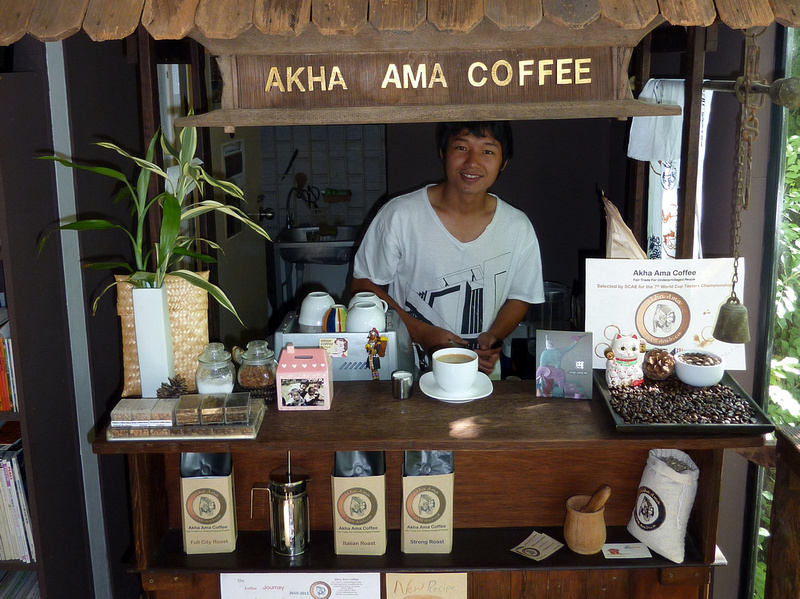 THere weren’t selling any coffee there, but the coffee is for sale at the Akha Ama cafe in Chiang Mai. hello! If I also wanna have a coffee farm tour, how can I connect with them? I’m already in Bangkok now. They don’t run the tours very often but contact them on their website http://www.akhaama.com/contact/ or Facebook page. wow what a cool experience! We are going to Chiang Rai on our own. Is there a way to visit this place without going on the tour?